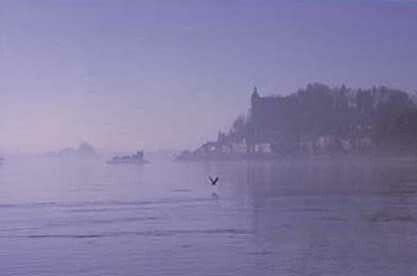 Till the middle of the 19th century Ottensheim was the only location between Aschach and Linz, where it was possible to cross the Danube from Mühlviertel to the south. Furthermore, a rock at the left river side, the so called "Schröckenstein", blocked the way to Linz. So all goods from Mühlviertel and Bohemia had to be shipped to the other side of the Danube. Before long the old ferryboat was unable to manage the growing needs of transportation. About 1860 under the leadership of Jakob Sigl, the owner of the local brewery, some Ottensheimer citiziens planned to build a new "flying bridge". On december 12, 1870 the government of Upper Austria granted to the new founded corporation "Drahtseilbrücke Sigl & Compagnie" the right of transporting persons and goods between Ottensheim and Wilhering. 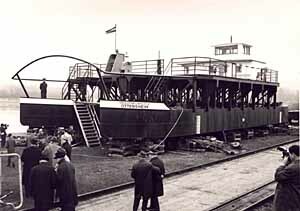 In the course of a great public festival the new ferry was opend on july 2, 1871. The ship was consecrated by Abbot Alois Dorfner from the Wilhering Abbey, which was the greatest joint owner besides the Bank of Upper Austria (today: Oberbank). Unfortunately the current business was not as good as expected. The proceeds were not sufficient to pay off the interest at all. High water and icedrift caused defects and further costs. In 1882 a high water damaged the landing stage and the corporation had to be liquidated. Dr. Nikolaus Ambos, doctor in Ottensheim, founded a new corporation, still under the name "Ottensheimer Drahtseilbrücke Sigl & CO". In 1933 Franz Sigl, who was a personally liable partner, left the company. Instead of Sigl Mr. Hans Ambos joined the company. It was renamed in "Ottensheimer Drahtseilbrücke Hans Ambos & CO" by then. After the expropriation of the Wilhering Abbey by the Nazi regime in 1942 the "Reichsgau Oberdonau" joined the company but sold its portions to the local government of Ottensheim. 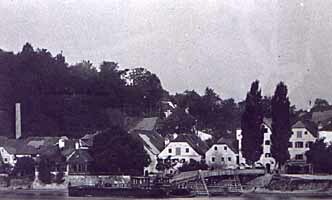 Until 1948, when the Wilhering Abbey got back its portions, the municipal office of Ottensheim was liable partner of the Danuebeferry Ottensheim. Since the old boat from 1871 no longer met the requirements a new boat (with a capacity of 40 t) was ordered from the shipyard in Linz ("Schiftswerft Linz AG") at the price of ATS 1,270,000.-- (€ 92,300.--) at that time. 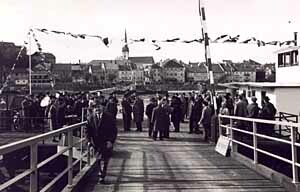 The new ferry was put into service on april, 25th 1964 and consecrated by P. Philibert Höbart.